On September 30, 2016, ESA’s Rosetta spacecraft came closer than ever to the target it had studied from afar for more than two years, concluding its mission with a controlled impact onto the surface of Comet 67P/Churyumov-Gerasimenko (67P/C-G). This second comet landing followed the pioneering endeavor of Rosetta’s lander, Philae, which became the first probe to successfully touch down on a comet on November 12, 2014. With a suite of 11 scientific instruments on board, Rosetta collected an impressive amount of images and other data at this now iconic comet, scanning its surface, probing its interior, scrutinizing the gas and dust in its surroundings, and exploring its plasma environment. Scientists have been using these measurements to advance our understanding of comets as well as of the history of our Solar System. This image shows a portion of 67P/C-G as viewed by Rosetta on September 22, 2014, only one and a half months after the spacecraft had made its rendezvous with the comet. At the time, the spacecraft was 28.2 km from the comet center (around 26.2 km from the surface). 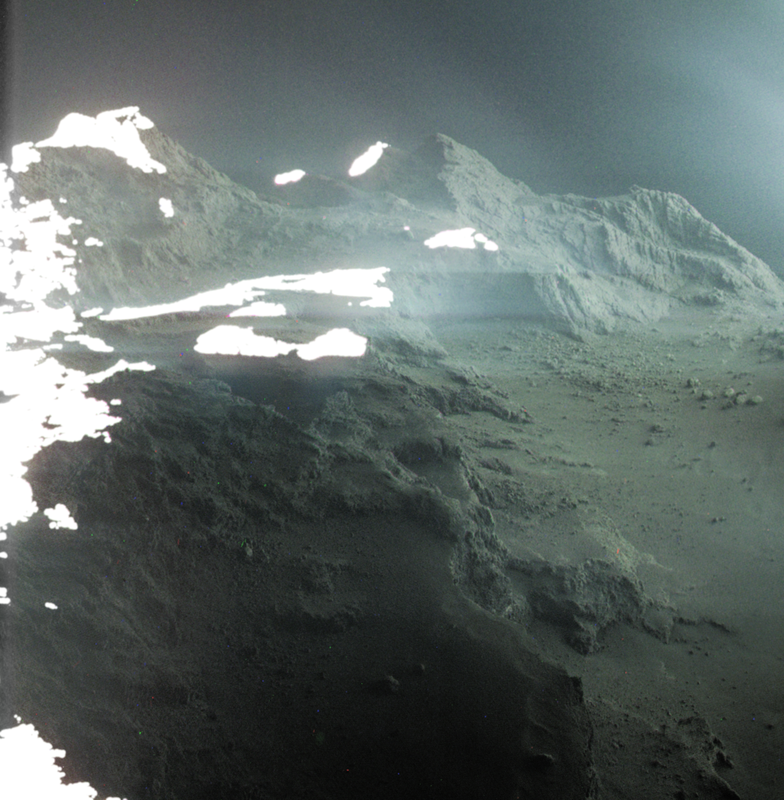 Amateur astronomer Jacint Roger Perez, from Spain, selected and processed this view by combining three images taken in different wavelengths by the OSIRIS narrow-angle camera on Rosetta. Seen in the center and left of the frame is Seth, one of the geological regions on the larger of the two comet lobes, which declines towards the smoother Hapi region on the comet’s ‘neck’ that connects the two lobes. The landscape in the background reveals hints of the Babi and Aker regions, both located on the large lobe of 67P/C-G. For a wider image of this region in the overall context of the comet see here. The sharp profile in the lower part of the image shows the Aswan cliff, a 134 m-high scarp separating the Seth and Hapi regions. Observations performed by Rosetta not long before the comet’s perihelion, which took place on 13 August 2015, revealed that a chunk of this cliff had collapsed—a consequence of increased activity as the comet drew closer to the Sun along its orbit.